Syngene’s revolutionary GeneSys image acquisition software has been developed for use with G:BOX, G:BOX mini, GeneGnome and InGenius3 systems. GeneSys ensures scientists can quickly capture excellent images of even complex multiplex gels. For use in Syngene’s G:BOX Chemi and G:BOX mini imaging systems, the new GeneSys software now includes a “stain-free” imaging icon. The icon has been set up using optimum filter and lighting conditions that Syngene’s technical specialists have determined can accurately detect nanogram levels of protein on a Stain-Free gel. GeneSys software also includes QuickQuant, a feature for rapid band quantification analysis on blots or gels. For use in Syngene’s G:BOX, G:BOX mini and GeneGnome systems, QuickQuant is ideal for scientists who need to perform rapid band quantifcation while they are using their imager. It makes it easy to analyse protein or DNA down to nanogram levels as soon as they have captured their gel or Western blot images. 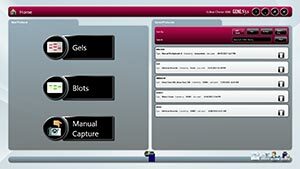 GeneSys image capture software is suitable for a CFR21 Part 11 compliant environment. Intuitive software. The user only needs to tell GeneSys which application they are using along with their gel or blot size and the software will automatically configure the system for that application. At the heart of GeneSys is an extensive database that contains over 300 commercially available dyes and stains. Protocols save the sample type, dyes, lighting and filters used and the position of the iris/focus and sample size so the user clicks only one button to capture an image. The ability to perform automatic, semi and manual image capture as well as single series and multiplexing for fluorescence and chemiluminescence applications. This powerful feature auto-corrects for edge effects caused by all lens and lighting in imaging systems, providing a consistent image for scientists to accurately quantify DNA and proteins on their gels. This enables you to output larger resolution images for publication purposes. Unique algorithm which perfects image capture. GeneSys automatically sets the black and white levels of the captured image to the optimum setting. This results in improved definition between bands or spots and the background of the image. The user is able to enhance the image, add annotations, view 3D images, save or print. Save as proprietary SGD (suitable for GLP environments), TIFF, JPEG or BMP formats. Rapid band quantification and molecular weight analysis of your gels and blots. QuickQuant can measure total and average quantities, can determine relative and actual amounts of DNA and protein, as well as detect the presence/absence and up/down regulation of bands and their associated molecular weights.